We absolutely LOVE the extreme volume of this look, showing that if you have thick hair there’s no need to fear a big look! To style thick, voluminous hair without tangling, apply a pump of L’Oreal Professionnel 10-in-1 onto damp hair to detangle with the Tangle Teezer, and blow dry with the head flipped upside down for root lift. Smooth out the hair by using a round brush to finish off drying prior to cutting — since this allows Anh to take into account the hair’s natural texture in choosing which cut is best suited to the client. The soft undercut is a favorite for thicker hair since it allows for movement while simultaneously removing excess weight. 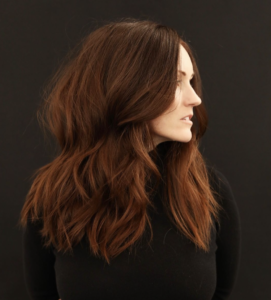 The finished cut was styled with Lived in Waves in alternating directions and a spray of Infinum3 for hold without stiffness.